STAKED is Available for Pre-Order! Get your copy of STAKED by Chelsea Lynn Charters! Pre-Orders opened up June 5, 2018, with a June 22, 2018 release date. If you love vampire books or even urban fantasy with a strong female protagonist, then this is the book for you! Lina Holiday has been hunting vampires all her life. Eager to rid the world of the blood-sucking monsters that hide in the shadows, she and her team of elite vampire hunters keep Chicago’s streets safe, but there is one vampire that she has yet to exterminate. For years Lina has tracked the ruthless vampire known as Stoney, who was responsible for killing her parents, and she will stop at nothing until she drives a stake through his heart. However, Stoney has other plans for Lina, and when he abducts her comrades and takes them to his secluded vampire coven, she is forced to make a deal with him. Lina must sacrifice herself, and her revenge, in order to save their lives. Can Lina rescue her teammates from a fate worse than death, or will she fall prey to Stoney’s evil plan and lose the ones she loves once again? You can order your paperback copy through Ink Smith Publishing’s website starting June 5. Books will ship after June 22. Just in time for a creepy summer read! Have you met Dawn Napier, yet? Our author, Dawn Napier, author of Star Pack, has a few more writing projects in the works. Check out Star Pack on our website! We took some time to ask her a few questions about her writing, her inspiration, and some other fun questions. Check out her interview below! Dawn’s favorite color is red – so we decided to add a little color to our interview! Ink Smith: What are your current projects? Dawn: I’m currently writing a sequel to Star Pack, and I’m finishing a last coat of polish on a recently completed fantasy novel called Vellichor. Ink Smith: Can you share a little of your current work with us? Dawn: It’s called Sea Pack, and it’s the continuing adventures of the space-faring werewolves I wrote about in Star Pack. They have moved on to explore the rest of our solar system, and they’re currently about to make contact with life on Europa. 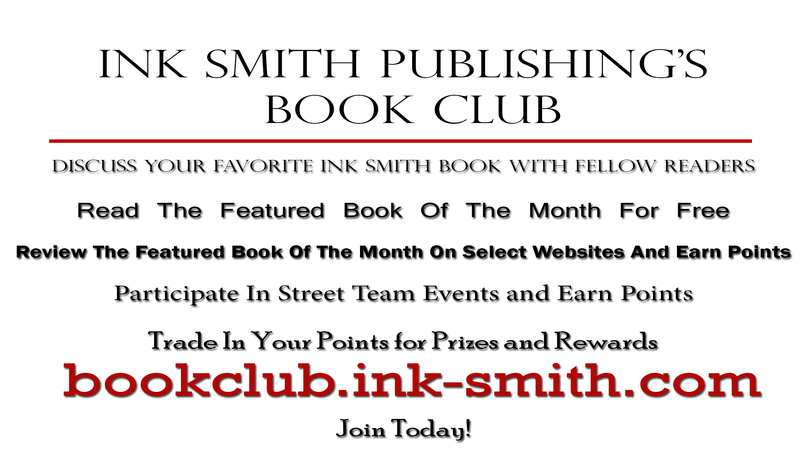 Ink Smith: What is your favorite book? Ink Smith: Is there anything you find particularly challenging in your writing? Dawn: Science fiction is hard. My last couple of books have been fantasy, and in a fantasy novel if something’s not working you can just change the rules. But even with extragalactic werewolves I have to at least try to follow the laws of physics. NASA is finding out new things about our local planets every day, and I have to try to keep up with their discoveries so my book stays current while I’m writing it. Ink Smith: Did you learn anything from writing your book(s) and what was it? Dawn: I learned that you can’t world-build by the seat of your pants. I had to learn how to plot in order to finish it. Ink Smith: What inspired you to write your first book? Dawn: I don’t have any idea. It never occurred to be NOT to write it. Ink Smith: What is your favorite food? Ink Smith: Do you have a specific writing style? Dawn: I guess you could call it Stephen King meets Piers Anthony and their love child collaborates with HP Lovecraft. Ink Smith: Is there a message in your novel that you want readers to grasp? Dawn: I had a few themes and symbols in the back of my mind when I wrote it, but I’d rather people read it and enjoy it on their own terms. I’d love to hear from people who have found messages of their own in it. Ink Smith: Do you recall how your interest in writing originated? Dawn: I have no idea. I think I was about six. Ink Smith: Do you have any advice for other writers? Dawn: Don’t TRY while you’re writing. Don’t try to sound like anyone else, but also don’t try too hard to be original. Don’t try to make the story follow a certain path, and don’t try to guide your characters’ fates. You’ll find your own voice organically the more you write, but you have to sit back and let the muse do her thing. Ink Smith: If you had to do it all over again, what would you change, if anything, in your latest book? Dawn: I would have made the character’s names have meanings. Ink Smith: Who is your favorite author, and what really strikes you about their work? Ink Smith: Do you have anything specific that you want to say to your readers? Dawn: If you don’t have a library card go get one now. Libraries are a magical place where anyone can learn anything for free. They’re staunch defenders of the Constitution, and they will help you learn whatever you need to know without checking your credit or health history. Everyone needs to use and love their libraries, so they stay with us forever. Dawn Napier grew up in Waukegan IL, and upstate New York. She has a husband, three children, and a ridiculous number of pets. She grew up reading Stephen King, Isaac Asimov, Mercedes Lackey, and Piers Anthony. When she’s not reading and writing, she is hiking with her dogs, napping with her cat, or cleaning up after her herd of adopted guinea pigs. Visit her online on Facebook and her website dawnsdarktreasures.com! Keep an eye out for our upcoming novel Star Pack by Dawn Napier, hitting the shelves December 2016! The hunters have reached the stars, with the help of a remarkable mineral called the leap gem. Across the galaxy they travel, collecting scientific wisdom and harnessing the natural resources of the worlds they discover. When they discover a distant planet with gravity and oxygen similar to their own, it looks like a world ready-made for conquest. Mirra, the youngest star captain in history and possibly the most ambitious, leads her pack to the surface with the expectation of mastering and owning this new world. She names it Otsanda, the She-Wolf. But there are a few surprises waiting for her and her crew. The first is that the world is already inhabited by intelligent creatures, making it unfit for colonization, to Mirra’s bitter disappointment. The second is that the two-legged inhabitants bear a striking resemblance to the Garou hunters themselves. The resemblance is so close, in fact, that the science officers wonder if the two species could be related. But that’s impossible. The third surprise is that the natives seem to know all about the hunters. They scare each other with stories about them, about their moonlit curse and their bloodthirsty past. What started off as stories local ER doctor Jacob Kennedy made up featuring his kids as main characters soon morphed into a project big enough that he asked local writer Jean Knight Pace if she’d be interested in co-authoring a book. She was excited to join up, adding to the story with her own ideas and style (and slipping her children into some of the character’s skins as well). Before they knew it, Kennedy and Pace had crafted what began as a few paragraphs of backstory into a book of high fantasy for tweens and teens. Instead of dragons, elves, and dwarves there were werewolf monarchs, talking dogs, and impoverished humans winding their way through a story that culminated in a Gladiator-style tournament—a tournament won (or lost, depending on how you look at it) by an unlikely hero and an unlikely traitor. Join Jean and Jake as they launch/debut their new book, Grey Stone, at Barnes and Noble on August 20, 2016 at 3:30 pm, at the Evansville, IN, location. There will be giveaways, contests, a book signing, Q & A, and (naturally) candy and laughter. Jean Knight Pace has had essays and short stories published in Puerto del Sol, The Lakeview Review, Crucible, and other literary magazines. Jacob Kennedy is an ER doctor who dreams werewolves and tournaments in his free time. Both of them live in Evansville with amazing spouses, boodles of kids, and furry pets who (as far as anyone knows) do not speak. You can find out more at jeanknightpace.com, jacobkennedybooks.com. Purchase Grey Stone from Amazon of Barnes and Noble. It’s almost here! Grey Stone by Jean Knight Pace and Jacob Kennedy is coming to you July 28, 2016! This Teen/Young Adult novel is one of the newest editions to the Ink Smith family. This fantasy novel takes a unique twist on the werewolf legend and myths surrounding them. Jean Knight Pace and Jacob Kennedy have created a world in which werewolves rule, dogs sing and humans serve – all under the constant light of the red sun. In the land of the great red sun, wolf-shifters reign—able to wield magic and shift form at will while privileged wolves serve them. Dogs rove through the woods in packs speaking, singing, and scavenging—afraid to befriend the humans who live repressed. As the lowest of all four races, the humans work at mines, fashion metals, and send over half their gains to the wolf-shifting king. However, when Pietre, an impoverished human boy, finds an unusual, orphaned pup in the woods, the wolf-shifting prince is sent to arrest his father. It’s then that boy and prince begin to realize that obeying the rules might be just as dangerous as breaking them. Unfortunately, breaking the rules means they’ll have to learn to work together if they want to change their world before it turns on them. Stay tuned for the link to pre-order this new YA fantasy novel!